This is where I would normally say "oh my goodness, I don't know where August went!". Except that, this time, I do know where August went. As you know, I've had a very change-filled 2014, both professionally and personally. I left my full-time career a few months ago in order to focus on Sincerely, Jackie. I knew that I needed a period of detox between leaving my job and diving into Sincerely, Jackie. I needed time to adjust, to gather my thoughts, to work on some back-end business things, and to figure out exactly why I wanted this business, and what I wanted it to offer to myself, my clients, and the design industry as a whole. While I don't necessarily have all the answers, I feel so refreshed after having had the time to really think about and develop the things within my business that are important to me. I know that paying it forward, educating, collaborating, honoring tradition, and celebrating are all key aspects of what I believe my purpose to be. This blog is not just a space for me to showcase my own design projects, but to also be a resource for both my clients and my peers. MONDAYS will be Heirloom Highlights. This is when I will showcase Sincerely, Jackie design work and features. From gorgeous letterpress wedding invitations to cheerful childrens birthday invitations, I'll devote Mondays to pretty paper goodness. TUESDAYS will be Stationery 101. I've done Stationery 101 posts in the past, and they're a great way for my to educate both clients & peers about the uuber nerdy parts of stationery. I'll cover everything from print methods to etiquette, and I absolutely will get obsurdly excited about things like die cutting. WEDNESDAYS will be Paper Cuts. I'll share all the behind-the-scenes types of things on Wednesdays. From business learnings and tips, to life happenings and updates. 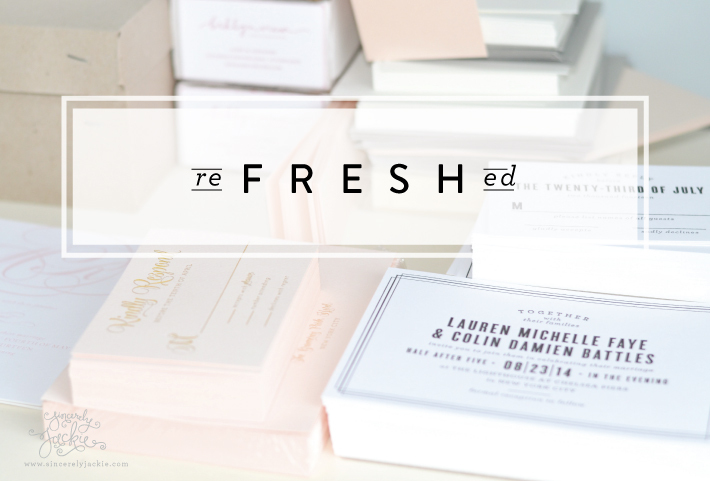 Stationery designers, small business peers, & industry friends, Wednesdays are totally for you. THURSDAYS will be Catchall day. I wanted one day to be a whatever-I-feel-like-posting day. Maybe you'll get a preview of a new design, or a business tip, or a heart-to-heart type of post. Whatevs. It's Thursday. I can do what I want. FRIDAYS will always, always, always be Font Friday. I'll continue to share my favorite fonts, and I'll also start gushing over the people behind the fonts. Calligraphers, letterers, and font designers are going to be included in Font Fridays moving forward. I hope you're all as excited about these changes as I am. I truly hope to provide you information that's helpful, inspiring, uplifting, cheerful, and a whole lot of fun.